Click the button below to add the Strategic Angler Kratos to your wish list. Top predatory game fish like Giant Trevally, Tuna, Marlin and Sailfish will feed on baitballs comprising of small prey as they are easier to capture. In all feeding frenzies, the weakest ones are targeted first as they provide a better energy expenditure ratio. However, such apex predators have a primal urge to nourish and satisfy their high energy requirements by opportunistically feeding on much larger prey. Enter the KRATOS. 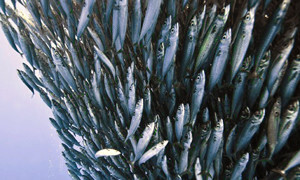 Kratos embodies the ideal saltwater baitfish including adult mackerel, herring, mullet, scad, squids and small tuna. Kratos is the perfect lure for the perfect predator. Imparting your desired action on the Kratos is easy since the lure has been tuned to accept a wide variety of hook configurations; including a front assist-hook. The Kratos’ amazingly stable design enables it to be retrieved at both slow and very fast speeds while keeping a consistent action. This lure stability is shown when the lure is retrieved at a high speed -OR- trolled! Kratos can be trolled at a modest 6-8 knots and can handle speeds up to 14 (see hook recommendations). Imagine trolling a weedline or temperature break while looking for signs of life. Seeing a frenzy in the distance, you grab your spinning rod, retrieve the lure and cast to the feed of a lifetime! KRATOS has been designed for maximum presentation while offering an impressive silhouette in the water, attracting all the apex predators in a food chain. CASTING the lure and twitching the rod tip during the retrieve will impart a side to side cadence, keeping the lure in the feeding zone where it is most effective. Sweeping the rod tip in a downward motion will allow the lure to dive down with a swift tail kick. A pause between rod sweeps will make the lure float horizontally for maximum presentation for the target species to notice. The broad silhouette of the lure will attract predators from below, while the impressive side profile will catch the keen eye of any hungry species from a distance. TROLLING can be achieved by strategically placing the lure past the prop wash while the boat is at IDLE. While a spinning reel may be used while high speed trolling, keep in mind that the drag and line will vibrate exponentially as speed increases. If you are looking for the split rings, you can find them here. We recommend #10 or #11 split rings for this plug.